The Triumph of Isabella Experience is coming up on 9/20 and 9/23! Coming up next week is The Triumph of Isabella , the inaugural production of our International Program for Creative Collaboration and Research (IPCCR)! See below for more information about the immersive multimedia experience that will take place here at the Clarice Smith Performing Arts Center on Thursday, September 20 and Sunday, September 23. And check out the year-long Triumph of Isabella exhibit at the Michelle Smith Performing Arts Library, if you haven't already! "The Triumph of Isabella" is a year-long exploration of the performing arts depicted in eight iconic paintings from the 17th century. These images have only been seen together twice in modern times and are presented here through high definition imaging in collaboration with the Victoria & Albert Museum, London, the Prado, Madrid, and the Royal Museums of Fine Arts, Brussels. " Act I: “From the Infanta’s Triumph to the Sultan’s Elephant." Learn about the legacy of Early Modern public performances on 21st century street theater in this multi-media presentation by Dr. Susan Haedicke, a street theater specialist from Warwick University in England. ACT II: “Exploring Art Through Performance” features a variety of short, live performances of physical theater, music and dance along with short video clips of modern street theater and opportunities to check out augmented reality performances from the artwork on your smartphone. Act III: The “Immersive Experience” invites you onto a street in Brussels in 1615, as depicted in the artwork, but projected life-size and with a soundscape of the city’s aural environment. You will see the images at full scale and in magnified detail, then be welcomed to the 1615 Ommegang by a "Living Portrait” from the paintings. 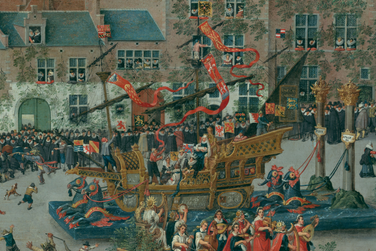 The procession, with its pageant wagons, giants, dragon, unicorn, devils, street musicians, religious statues, musketeers and representatives of all social orders will pass by — digitally animated to at life-size from the paintings. More information about the multimedia experience and the entire project here . TDPS accompanist Bob Novak composed music for the dance film “Dancing Around the World," which won the Silver Palm for the Mexico International Film Festival. It will be shown at the EX/Art Film Festival in Pavia, Italy and at the Museum of Art in Bologna in September 2018, as well as at the following festivals: RIFF Festival in Norway, Mexico International Film Festival, and Elevate Festival in Chicago in October 2018. See trailer above. Cary Gillett and Jay Sheehan's 2016 book, The Production Manager’s Toolkit, was featured in Stage Directions magazine, in which they share their inspiration and process for writing the book. Read more here. Dance professor Crystal Davis published a chapter in The Palgrave Handbook of Race and the Arts in Education (2018). The chapter, “Tendus and Tenancy: Black Dancers and the White Landscape of Dance Education,” co-authored by Jesse Phillips-Fein, looks at dance education through a critical race theory and whiteness theory lens. Read more here. Design professor Jared Mezzocchi was nominated for a Suzi Bass Award for his set design for “Ripe Frenzy” at Synchronicity Theatre. “Ripe Frenzy” was written by playwriting professor Jennifer Barclay to address the issue of school shootings. Go team TDPS! Christina Banalopoulou (PhD ‘18) published an article in the Performance Philosophy Journal about the Greek Debt Crisis. Swing Gate Creative Group is seeking a costume designer who relishes a challenge! Get credit for your work and add to your portfolio. Send a brief bio and a link with up to 3 samples of your work to brenda@swinggatecg.com. The Severn School is in need of someone to help construct sets this year as part time contracted work such. Please contact r.redei@severnschool.com if you are interested. Maryland Shakespeare Players is putting out a community-wide call for directors who would like to lead a scene from one of Shakespeare's works on November 3, 2018. For more information and to apply, see this form. Contact md.shakespeare.players@gmail.com with any questions. Fulfillment Theatre Company is auditioning for "A Heart’s Cry." 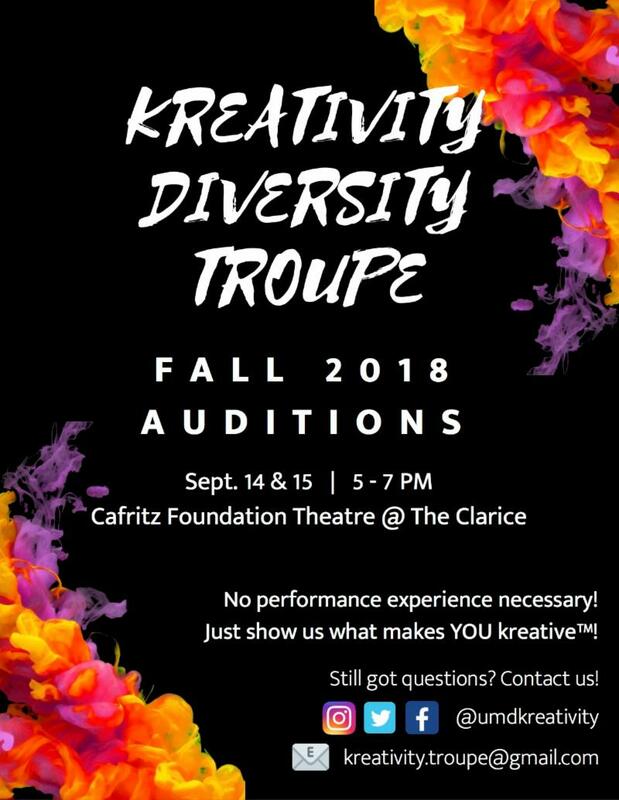 Check out audition information and dates here. Arts on the Horizon is seeking drummer/percussionist for its upcoming spring 2019 production of Beep Beep. Check out the details here. UMD Orientation is hiring for next summer 2019! Check out this great summer job opportunity here.